Flickr user LincolnStein. Some rights reserved. When Edith Wharton’s novel “Ethan Frome” was first published in 1911, reviews were largely negative. Critics called the story cruel and violent and sales of the novel were dismal. Today, Edith Wharton’s haunting tale of forbidden romance in a rural New England town is her most widely-read novel. This was an unusual novel for Wharton. Her first novels, like “The House Of Mirth,” are novels of “manners” and New York high society, said Goldsmith. But while living in New England, Wharton observed a lot of poverty. When living in Lenox, she found this story. She heard a story of a sledding accident in which one woman was killed and two others were severely injured, and she decided to use it as a germ for this novel, Goldsmith said. Wharton wanted to reverse the stereotypes of New Englanders that other writers had been perpetuating, which were a creation of a kinder, gentler, sanitized New England. Wharton was very wealthy – one of the wealthiest women in New York in the mid-19th century. Her family came from the family from whom the term “keeping up with the Joneses” was coined, Goldsmith said. “Money is involved in this novel all the time,” Pfordrescher said. Though Ethan’s wife, Zeena, is essentially the villan of the story, she is also a little sympathetic, Page said. She sees the affection and love that is blossoming between Ethan and Mattie, a young girl who is sent to live with them who has nowhere else to go. “There’s a struggle for dominance in this claustrophobic impoverished New England farmhouse where the two women and man sit all day, struggling against each other,” Prordrescher said. Wharton felt trapped in her marriage, Goldsmith said. She had suffered a breakdown, as had her husband, Teddy. The anonymous narrator of the novel is presumably male, Pfordrescher said, and seems to see the story from a very male perspective. “It would seem to me that there’s a bit of Edith Wharton in all of her major characters, that I can see her in some ways as like Zeena because she had an unfaithful husband. I can see her as perhaps yearning to be the Mattie who would be sort of adored,” Pfordrescher said. MS. DIANE REHMThanks for joining us, I'm Diane Rehm. When Edith Wharton's novel "Ethan Frome" was first published in 1911, reviews were largely negative. Critics called the story cruel and violent and sales of the novel were dismal. Today, Edith Wharton's haunting tale of forbidden romance in a rural New England town is her most widely read novel. MS. DIANE REHMJoining me for this month's readers' review of "Ethan Frome," Lisa Page of the PEN/Faulkner Foundation, John Pfordrescher of Georgetown University and Meredith Goldsmith of Ursinus College. I hope you'll join us, 800-433-8850. Send us your email to drshow@wamu.org. Feel free to join us on Facebook or Twitter. Good morning to all of you. REHMGood to have you here. And, Meredith Goldsmith, I neglected to say, you are Vice President of the Edith Wharton Society. This is quite a novel. John Pfordrescher, tell us who Ethan Frome is. What do we learn about him during this tragic story? PFORDRESCHERIt's a story told in two time frames. Begins in what might be thought of as the present, around 1911. And the narrator tells us that he's the most striking figure in this small town, in Massachusetts, even though he's a ruin of a man. So the novel is, in a sense, an exploration of how he reached this ruinous state and the -- his physical size and his inner strength, which the narrator recognizes right away, makes for a compelling kind of puzzle. What has happened to this fellow? And that's what the novel then unfolds. REHMLisa Page, why does the novelist use an anonymous narrator for this book? PAGEI think that position as outsider coming into this terribly bleak place sets things up so that as an outsider, he can present the characters and introduce them in an intimate way. As he gets to know them, the reader gets to know them. REHMSo he brings us into the life of Ethan Frome, rather -- is that, you know, a literary trick? PAGEWell, I think so. I mean, clearly, it's in first person. It's opening up with this personal rendition of events as opposed to "Once Upon a Time, Ethan Frome lived in the wintry..."
REHMInteresting. And, Meredith Goldsmith, how unusual a novel was this for Edith Wharton? GOLDSMITHWell, she heard a story of this sledding accident in which, I believe, one woman was killed and two others severely injured. And so she decided to use it as she often found germs of her stories. REHMI can remember, years and years ago, seeing this film with Sterling Hayden. I shall never forget it as long as I live because you jumped ahead to the sledding accident which is the culmination of this story. But did she see, as she was living in Massachusetts, people like Ethan Frome? GOLDSMITHAbsolutely. One of the things that Wharton said about her New England writing is that she wanted to sort of reverse the stereotypes that other New England local color writers were creating of a, sort of, a kind of kinder, gentler sanitized New England, essentially. REHMWhat was going on in her own life at the time? GOLDSMITHWell, I think part of what's going on in "Ethan Frome" that's related to her own life is that she was in a very unhappy marriage and had been estranged from her husband for years who'd also been mentally ill. She was essentially supporting him. So she was very much locked in a caretaker role. And had also had an affair which was really the first time she'd had a happy relationship, apparently. But that didn't seem to have a future either. REHMDid she marry into a wealthy family or did she have her own wealth to begin with? GOLDSMITHShe had very much her own wealth. She was one of the wealthiest women in New York in the mid 19th century. And her family came from the family from whom the term keeping up with the Jones' was apparently coined. REHMAnd the man she married, what was he like? GOLDSMITHApparently, you know, a sort of a gentleman, but then a sort of dissolute aristocrat who apparently drank, may have been fooling around with other women and just ultimately had a lot of problems. REHM...how does she come to work for the Frome's? PFORDRESCHERWell, money is involved in this novel all the time. Mattie's father has suffered severe economic reverses and then both her father and her mother die. Isn't that right? And she's sort of thrown onto her cousins as an unwanted dependent. And they send her off to Ethan and his wife, Zeena. PFORDRESCHERNobody wants her, no. And she seems to be sweet, tender and affectionate, but not very affective at Zeena, Ethan's wife, is always faulting her because, from Zeena's point of view, she's not a good caregiver or housekeeper. REHMZeena strikes me as the perfect example of a hypochondriac, Lisa. PAGEI think that's dead on. I think she is a hypochondriac. But I will say, even as she's really the villain in a lot of ways in this story, I found her sympathetic as well. PAGEWell, because I think she sees what's happening between Mattie and Ethan. I think they're both clearly quite taken with each other. Mattie Silver is not paying attention to Zeena who needs all this care. And she breaks her best china. You know, they're having a great time while she's upstairs in bed. And I think that that's enough. REHMHonestly, I think that's overstating it when you say, they're having a great time. I think this is a novel of repression, repression in almost a violent state. I mean, I can feel Ethan Frome breathing. He's so muscularly constrained because he's loyal to his wife and yet he loves this young woman, John. PFORDRESCHERAnd I think there's a crucial word in the middle of the story which is mastery. At the end of one of the chapters, Ethan has been speaking very firmly to Mattie. And he suddenly feels, this is what you're talking about Diane, he suddenly feels a kind of wonderful inner glow because he's mastered Mattie. And then of course, in the very next chapter, the revenge of Zeena is to master him and he realizes that she's mastered him. So there's an endlessly -- there's a struggle, maybe not endless. There's a struggle for dominance in this claustrophobic impoverished New England farmhouse where the two women and man, sit all day, struggling against each other. GOLDSMITH...heroize Ethan and I don't know, turn Mattie into this sort of charming little creature. And I think because of that narrative perspective, it's hard for us to see that there may be more going on there. And I think that that does have to do with what Zeena's seeing and observing of the marriage that she went into with a different set of aspirations that's no longer there. GOLDSMITHAbsolutely. I mean, I think Zeena came into this situation as the caretaker and what we see when she was taking care of Ethan's mother is in a way, she set Ethan free. You know, there's a line where Wharton says, you know, Ethan hadn't known what it was like to sort of go out with the guys. You know, until Zeena came into the household. And then he married her and Zeena was someone who wanted to get out, you know. She had a desire for a different kind of life and then she settles into this sort of bleak situation where she's now Ethan's helpmeet, essentially. REHMWhy does Zeena decide to marry Ethan? GOLDSMITH...only to learn later that she's so good at it because she's studied her own illnesses. But initially, it just seems like a natural, just one thing leads to another. PAGEShe's also seven years older then Ethan. REHMSo how does -- I mean, does Ethan -- as soon as he lays eyes on Mattie, does he fall in love, John? PFORDRESCHERI think so. He gets her at the train, picks her up, right? And even bringing her back, that begins. I find it interesting how the novel figures her. We are drawn -- our attention is drawn to certain aspects of her, her hair, her mouth. And then other aspects, we don't get. REHM800-433-8850. That's the number to call if you'd like to join us as we talk about Edith Wharton's long lasting novel "Ethan Frome" which has been made into two Hollywood productions. The first I saw with Sterling Hayden. I have no idea who played the female leads. And then there was a second more recent film. Who was that starring, Meredith? REHMAh, Liam Neeson, absolutely. Here is a posting on Facebook from Laura. She's says, "I'm a long time listener now living in the Middle East. I have two questions. Number one, what is the significance of Edith Wharton's choice to not disclose the gender of the narrator in the book? And number two, Mattie said she liked Ethan because he was nice to her. But Dennis, the young man who's courting Mattie, was also nice to her. Why did she choose Ethan instead of Dennis when Dennis had a better future?" Lisa. PAGE...number one. Number two, in terms of -- the second question, could you repeat that one more time? REHMMattie said she liked Ethan because he was nice to her. But Dennis was also nice to her. So why did she choose Ethan over Dennis? PAGEWell, Ethan is so plugged into Mattie. It's just from that minute he sees her. She's the light where there was always darkness. She's the warmth where it was always cold. Any woman's going to respond to that. PFORDRESCHERIt's an interesting question though because there is obviously that alternative that she turns away from because Dennis would've been a good provider. The Irish who are running this shop down in town make good money and become more and more prosperous as time passes. Had she married him she would've had a nice meal ticket. REHMBut was he less attentive, less absorbed in her? GOLDSMITHI think Dennis just sees her as a kind of another charming girl. GOLDSMITHBut I do have some more thoughts on this though. If we see that -- think that there's some tension between Mattie and Zeena, which I think there is -- you know, Mattie's been brought there as the poor relation essentially. Zeena has what Mattie doesn't. She has this man, you know. And so I think that there's some competition and rivalry there. REHMHere's another comment on Facebook from John who says, "I read the book for a high school English class. Apart from hating any book set in New England, I found no sympathy whatsoever for the characters in the book and found the whole---" I'm not going to even read this until we get a little later into the book. I want to ask you, Lisa, about the New Yorker piece by Jonathan Franzen about Edith Wharton. PAGEYes, in last week's New Yorker, Jonathan Franzen has done an essay celebrating the 150th anniversary of Edith Wharton. And he talks about sympathy as this Facebook thing just said. But he talks about sympathy around Edith Wharton herself, that she couldn't have sympathy because she was such a wealthy woman, because she wasn't an attractive woman. And he also talks about the sympathy generated around her characters and whether she indeed had sympathy for her own characters, particularly when they were pretty women. PAGEHe kinda jumps around quite a bit and there is -- it's received quite a bit of attention now. There's an organization in New York called Word of Mouth that is actively pushing to send letters to the editor at The New Yorker around this (unintelligible) . REHMWere you offended by it? PAGEI found his depiction of Edith Wharton simplistic and rather one dimensional frankly, the wealthy woman who's leaving her pages of manuscript for the maid to pick up while she lies in bed writing. You know, there have been an awful lot of male writers who have had money and had wives to pick up their pages. And I just found that -- and I'm a friend of -- a fan of Franzen's, but I found that outrageous. GOLDSMITHYou know, I have to agree. And first of all I have to say, Edith Wharton was a pretty attractive woman, to address the question of -- about Wharton's not being pretty. You should see. I mean, Wharton was a debutante. GOLDSMITHSo I think that that argument is not only problematic in a number of ways but also pretty selective. And then I think we have to distinguish between who Wharton was as a person, whom she socialized with, the kind of family she came from and so on and her imagination. Because the sheer fact that she creates this book and tries to enter into the lives of these characters who are very, very different from her, I think suggests an ability to empathize. REHMBut at the same time, how much of this novel do you see as perhaps autobiographical? GOLDSMITHDefinitely some. We've talked about that a little bit already the fact that Wharton was trapped in this marriage. There's also, you know, something that has to do with the fact that both, you know, Wharton had suffered a breakdown. Teddy had suffered a breakdown. GOLDSMITHHer husband. Fullerton was ailing so this issue of, you know, illness, mental illness, the attention that sick people receive and that they have to be given, I think that was something that was very much on her mind. REHMJohn Pfordrescher, do you think that men reading this novel perceive it somewhat differently? PFORDRESCHERWell, I think it's a very curious question. We've talked about this a bit already. The male -- presumably male narrator looking at this story of tragic suffering, I think, sees it from a very male perspective. And you talked earlier about Ethan being trapped inside of this passionate life that he lives. And I think men read that and think they understand it. PFORDRESCHER...adored, that's the word. Thank you. And it's quite common I think for really powerful writers to see bits and pieces of their inner life in many of the characters they create. REHMTell us who Mrs. Hale is. GOLDSMITHMrs. Hale is this sort of older woman that the narrator meets when he comes to the town and she's his landlady while he's staying here to do this project. And he learns that she's the one who's in fact found Mattie and Ethan after the accident and she's taking care of them. And in the prologue and epilogue of the story he's sort of trying to press her to find out what actually happened. And she reveals at the end some of the things that she's observed, which were essentially too painful to talk about in the entire narrative that's preceded it. PAGEBut also Mrs. Hale, who was a young woman the same age as Mattie Silver, has had love that -- where she married the person she was in love with. She hasn't had to struggle in secret the way that Mattie has and she hasn't had her own life end in tragedy. So they sort of play off of each other. PFORDRESCHERShe's the healthy one. I think the name is a pun, Hale and Hardy. GOLDSMITHBut she's the foil, but she also -- I mean, she's observed something really profound, you know, because she's the one who said after they found Mattie's body, you know, I say it's a pity that she lived. You know, which is I think a very shocking revelation. REHMOkay. All right, we're there. Let's talk about this sleigh ride. There is a huge elm tree at the bottom of the hill. 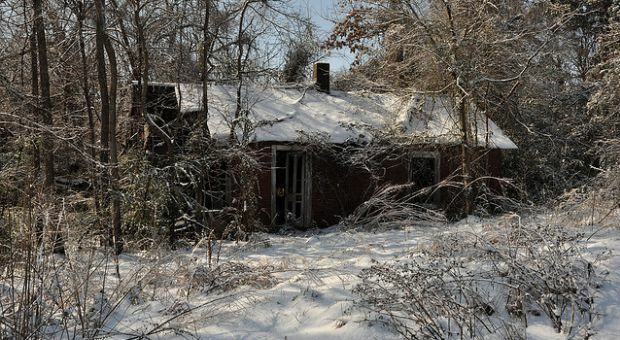 It's described earlier in the book and Ethan Frome says, there could be accidents there. And what happens? PFORDRESCHERWell, it's the day that Mattie's being driven out and Ethan's taking her to the train. REHMZeena has said, I don't want anything to do with her anymore. PFORDRESCHERShe has mastered them both and they feel absolutely trapped. He's taking her to the train. They've talked several times about having a ride down -- a sled I think we call in the Midwest. And this becomes for them the last thing they can do together. They take one ride down the hill. They come up and then the question is raised, shall we do it a second time. And Mattie says, I want to die. Effectively she says, I want you to run the sleigh into the tree and then we'll be together forever. PFORDRESCHERAnd Ethan says, okay. I want you to sit behind me and I'll be on the front of this -- and I think he wants to hit the tree first. PFORDRESCHERHe starts going down the hill and this is what we get. They're going faster and faster approaching the elm and the narrator says, suddenly his wife's face with twisted monstrous liniments thrust itself between him and his goal and he made an instinctive movement to brush it aside. And instead of having a head-on collision I assume they hit to one side. And they are both crippled in one way or another for the rest of their lives but they live. REHMBut Mattie takes the brunt of it. PFORDRESCHERYeah, she's -- it's worse for her. PAGEIt's way worse for her. There's a horrible description about he thinks he hears a mouse cheeping under the snow and then he realizes that it's her. And that her -- the noises are being made from her suffering. PFORDRESCHERThere's interesting moments when Zeena is a lot like a witch. She's interested in these medicines which are like potions. She has instinctive understandings of other people. And I take it that the fact that her face comes to him just at the moment when there might have been this suicide slash liberation and causes him to flinch is like a kind of hex. I think it fits with the New England setting where witchcraft, witchery is very much a part of the cultural tradition. REHMBut, you know, the landscape is certainly part of the novel. That pickle dish. Let's talk about the pickle dish, Meredith. GOLDSMITHAbsolutely, yeah. And Mattie sets up this little dinner, which sort of seems like a little presage of what would be to come if Mattie and Ethan were to have a life together. And she's taken Zeena's pickle dish to arrange the table. REHMShe wants it to look pretty. GOLDSMITHAbsolutely, absolutely. And the cat jumps up and smashes it. And so what happens is that Ethan takes the pieces, arranges them as if it were whole and puts it back up on the high shelf where Zeena put it. So on the one hand this seems like a kind of avoidant, you know, behavior on Ethan's part. REHMWish he had had Superglue or something. PFORDRESCHERHe goes down to town. REHMThere is no glue, yeah. GOLDSMITHBut it's also worth thinking about again why Mattie takes it. Mattie, again, who seems like a slip of a girl, it's hard to think she would imagine to get this. But she is usurping some of Zeena's property there. And part of why Zeena's so upset, it was a symbol of her marriage to Ethan at a time when she was happy. PAGEAnd a pretty thing, whereas they have so little. They have so little. PFORDRESCHERAbsolutely. Her line is, I tried to keep my things where you couldn't get at them. She says this at the moment when she's accusing Mattie of taking her thing. I think this thing-ness is important to the novel too. It's related to the whole question of money and how little money any of them have. And so things become very important for Zeena and obviously I think for Ethan and for Mattie they're not. REHMJohn Pfordrescher. He's professor of English at Georgetown University. And you're listening to "The Diane Rehm Show." Going to open the phones, 800-433-8850. To Shade, Ohio. Good morning, Stephanie. STEPHANIEGood morning, Diane. It's so nice to be on your show. I was so happy when you came to Athens, Ohio a few years ago. STEPHANIEAnyway, I have used this book when I've taught an American dialects class and I do a segment on literary dialect. And the thing that I find so fascinating -- 'cause what I do is I look at all the dialogue spoken by the characters and I analyze it. And Edith Wharton basically has Mattie and Ethan speaking pretty much standard English. But then she reverts to more of a New England dialect when she has Zeena speak. So Zeena instead of saying have, she goes a, you know, shoulda done that, instead of should have done that. STEPHANIEAnd she doesn't -- and then she employs something called I dialect where she'll spell a word like catch, instead of c-a-t-h-e (sic) she spells it k-e-t-c-h, which is -- there's nothing phonologically different between k-e and c-a that it makes her appear ignorant. That's a literary device. GOLDSMITHYeah, I can definitely see her doing that. I think Wharton was an excellent listener. And when she was traveling around New England that's one of the things she was doing. She was observing and listening. And I think it makes perfect sense that she would be not only picking up on the nuances of different people's speech, but also using them to reflect certain things about the characters. And in this case it sounds like Ethan and Mattie might seem a little more, I don't know, civilized, you know. PFORDRESCHERMore universal, more accessible to the reader. REHMI think we should point out that there are moments in this novel when Ethan really believes he can run away with Mattie. And then he begins to consider not only the practicality of that life but also how would Zeena be taken care of? PAGEAnd who would take care of Zeena? I mean, there isn't anyone else besides him to do that. And that's what's so stark. And, by the way, you also brought up setting here, Diane. PAGEAnd that is this stark, cold, wintery, barren. PAGEIt constantly -- it's relentless deprivation. REHMAnd deprivation somehow, especially because he goes to a neighbor and asks for money, asks for a loan upfront on the basis of work that's yet to be done. He is refused. He then thinks, I'll go back again. I'll ask him in a different way and this time it'll work. And then, with Mattie, on the spur of the moment, they decide to commit suicide. What a story. All right. We're going to take a short break here. We've got lots of callers waiting. We'll come back to them after a short break. REHMAnd we were talking during the break about that film. And as I recall it was not a film made in Hollywood, rather it was made for CBS Television as part of its Playhouse 90 series. Julie Harris played Mattie Silver alongside Sterling Hayden. And Clarice Blackburn played Zeena Frome. I can still see it. All right. Let's go back to the phones to Bobbie in Alexandria, Va. Good morning. REHMI'm good, thanks. Go right ahead. BOBBIEWell, I was just commenting on how I had to read "Ethan Frome" amongst the other grades (unintelligible) English Lit. class, junior year in high school. And he was one of the few PhD teachers for the whole school so he was very -- he was going to make sure that we knew that. And instead of really discussing like normal English classes as part of a daily curriculum, we got ready for the AP exam during the day and we were expected to read the book on our own. And at the end of each month we got, like, these grueling tests with details about each month's book. BOBBIEAnd I remember the exam for "Ethan Frome" and how just littered with these itty bitty details, but I will never forget. And I always associate with it since then these highlights of color that he specifically drew questions to that were both against the bleak physical environment and the bleak emotional environment, both. For instance, the red scarf, that's very much drawn attention to in the language of the book when, I think, they're about to slide down the hill for the very last time. REHMQuite right. Red scarf, red ribbon. GOLDSMITHRed ribbon. And I think it's the first evening when Ethan's taking Mattie home from the dance, he fantasizes about rubbing the scarf against his cheek. GOLDSMITHAnd I think that's another wonderful moment of that sort of struggle for communication that you're talking about, that this is the only connection he can imagine himself feeling. PFORDRESCHERAnd the pickle dish is red. REHMJohn, have you taught this book? REHMAnd the reason I ask both because of what Bobbie said and now an email from Virginia in Michigan. She says, "My high school age granddaughter, who's a veracious reader who loves almost everything she reads, hated 'Ethan Frome.' Should this book be on high school reading lists?" What do you think, John? PFORDRESCHERI wanna answer that by raising kind of a parallel question. I think that Edith Wharton wanted to write a tragedy. She refers to Ethan Frome on the first pages as tragic. And the question that forms in my mind, and it may be the reason why the early reviewers that you mentioned at the beginning of the show, Diane, didn't like it a whole lot, usually tragedies end in some kind of recognition that a terrible mistake has been made on the part of the tragic hero. PFORDRESCHERAnd then there is for the audience or the reader some kind of purgation, some kind of relief by, as Aristotle tells us, fear and pity that causes the tensions of the peace to go away from us, to drain out. But Wharton's novel doesn't give us that kind of an escape I don't think. And the last scene, which I think we're gonna talk about a bit more, in fact intensifies our sense of their sort of endless suffering in a kind of prison. PFORDRESCHERSo it's got the elements of a tragedy, but it doesn't have the release that we often have at the ends of tragedy. And I think that must bother some kids and adults too. REHMEspecially young people who are looking forward to life, who see life as unending good things happening. Meredith. GOLDSMITHI think part of this goes back to Wharton's status as a realist, that she's not someone who's going to give the reader the satisfaction of a romantic suicide essentially. And I think a botched suicide pact is evidence of that. People have to live with the consequences of what they've done. PAGEYou talked a lot about repression too, Diane, and restriction is sort of the theme. And they just get more and more restricted by the end. And that's very hard. It's very hard for the reader. REHMAnd of course I think we should talk about how all of this ends after the attempted suicide which, you know, for their sake you almost hope is the end. PFORDRESCHERIt's worse. Mattie undergoes some kind of a horrific transformation so that when we see her at the end of the novel and the conclusion, we see her bloodless and shriveled. Her dark eyes had the bright witch like stare that disease of the spine sometimes gives. And this business of blood, we've talked about red being associated with Mattie. Earlier when the two are so desperately in love, Ethan feels that her blood is in his veins. And now at the end she is bloodless and shriveled. PFORDRESCHERHe drags his semi crippled right side, his leg and his arm, around trying to make enough money just to support the family. And then Zeena, as we said, is the caregiver, but reluctant, resentful caregiver. And the three of them are locked in this farmhouse kitchen all winter long. And we've talked about the importance of the weather symbolically. The two lovers had this one moment in a summertime when they sat by a pond and Ethan found Mattie's locket. But for the rest, it's almost always in a cold, frozen moment. PFORDRESCHERAnd let me just add, the afternoon of the sledding, it's starting to thaw. And they go down and then of course there's the collision and the lifelong crippling. REHMLet's go to Little Rock, Ark. Good morning, Paul. PAULGood morning. How are you? PAULI'm calling to agree with the point about teenagers not reading this kind of literature. Yeah, I don't think Dickens, I don't think most of the great literature should be read because it is too depressing. I'm a writer, but I'm not gonna let any of it be published until I'm dead because it would depress my children. They would think I'm suicidal. But I think writers just take great pleasure in writing about tragedy. They relish it. They derive energy from it. But to the young reader, it's very upsetting. I think one has to be 40 or 50 to grasp the depth of some of these emotions that women like her were able to capture. PAGENot to mention all the tragedy that's on television. REHMWell, precisely. Thank you very much, Lisa. Okay. Let's go to Long Island, N.Y. Good morning, Vincent. REHMTell me how it turned out in your version. VINCENTIn my version, the only solution I could think of that the two of them could be together is if Zeena unfortunately passed away and the two of them, they sold the farm. And Ethan had mentioned awhile back he'd gotten a job as an engineer in Florida. I finished where they sold everything. They moved there. But before they left, Ethan saw the cat in the window. He turned to it and said to himself, never again, and they left happy. REHMWow. That's really quite something. I love it. Meredith. GOLDSMITH...than we've seen Ethan to be. I mean, when he fantasizes running away, and we even see an example of a man who did run away with the woman he loved and they have a beautiful child, he just says, well, I can't put Zeena in that position. Realistically, men left their wives. He could put Zeena in that position. So to one extent, he's honorable, but to one extent, he's I think resistant to change. I mean, this is Starkfield. People are locked in a certain way of living. REHMHe's resistant to change, but he doesn't have a dime to his name. REHMAnd that's the other part. I mean, how's he gonna do this? How's he even going to find train fare? He didn't even have train fare for Mattie. REHMSo it's tough. Vincent, you're very creative. I love it. Let's take a call from Kathy here in Washington, D.C. Good morning, you're on the air. KATHYJust in reference to these recent callers, and I'm a parent of two middle school aged daughters who are good students, I agree that things get read too early and I think that's a shame. But I don't think it's because it's too depressing. It's because you do need life experience to have encountered some of these issues. And unlike Shakespeare where you can read it on different levels, it's very hard to do that with things like "The Scarlet Letter" and "Ethan Frome" and some of the really great works of American and English language literature. KATHYAnd I'm just wondering, does the panel have any suggestions as to how to keep these things alive without voicing them at adolescence to really get turned off by them? I also think, well, the world's not going to heck in a hand basket across the board educationally, a lot of literature today is sort of a (unintelligible) phenomenon and kids really aren't able to deal with themes like being trapped, like being trapped in your own values, being trapped by the interaction between society and your own values and all of these things that really are the nuts and bolts of adult life. PAGEYeah, I'm sorry, I have to disagree with the caller. I think that exposure to literature beginning at a very early age, even difficult literature, sets up a life where you understand it and you seek it out. Whereas if you don't get exposed to literature at an early age, difficult literature, literature that isn't all happy endings, you have no foundation. REHMKathy mentioned "The Scarlet Letter." There is so much learning in the "Scarlet Letter." John Pfordrescher. PFORDRESCHERAnd obviously people who construct curricula see that for many of the students that they work with, this is their last chance to get these books into the hands of young people. And so there's this sense that we've got to somehow give them a bit and notice the sense of I give. REHMJohn Pfordrescher of Georgetown University. And you're listening to "The Diane Rehm Show." We do seem to have reached a point in teaching where we're sanitizing so much and trying to make the world into a place that it isn't. GOLDSMITHAnd I think the thing is, "Ethan Frome" may seem like it's distant because it's a different historical moment, it's older people, but I think the feeling of entrapment is something that, you know, lots of young people can relate to. And, I mean, you could ask the students, can you imagine what it's like to be closeted? You know, can you imagine what it's like to not be able to communicate something that's extremely important to you? REHMAnd can you imagine being trapped in life where you have no options? REHMThat seems to me something that could easily be understood. Let's go to Knoxville, Tenn. Good morning, Betsy. BETSYGood morning. I was glad the conversation took this turn, because as a parent, I would really hate my children's teachers to take the curriculum to not reading challenging literature and to not imagine that they won't reread some of these challenging works as lifelong learners. But my children have been watching Shakespeare since they were four. They've appeared in Shakespeare productions. And they get this challenging literature. They love Charles Dickens. It would be so sad if we eliminated the challenging, difficult and sad stories of "Oedipus" or "Macbeth" or any of these other things out of their curriculum. REHMHow about "Ulysses"? Not easy stuff. Here's a wonderful email from Lise in Texas. She says, "My sophomore high school English teacher not only had us read "Ethan Frome," but read every word aloud. It was one of the best literary experiences I've ever had. I adore the book. I believe plenty of young people are mature enough to grasp the subject matter and the literary genius of the language. I should mention that our teacher dealt with the issue of the tragic ending by assigning us to write our own alternative endings." REHM...and a great way to teach. PFORDRESCHERYou know, when you hear the experience of these callers, the one woman who was just given drills in details that are for tests, and then this most recent account, and in a sense here's one answer to the question we're talking about. Excellent teaching can take difficult texts and make them come alive for students and, as you're saying, Lisa, help people to grow through the text. REHMOf course. John Pfordrescher, professor of English at Georgetown University, Lisa Page who's president of the PEN/Faulkner Foundation, Meredith Goldsmith, she's professor of English at Ursinus College, vice president of The Edith Wharton Society. Thank you all so much. I love this discussion. PFORDRESCHERThank you. We did, too.